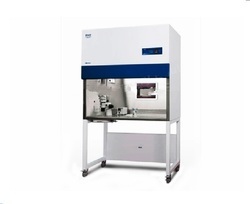 We offer an assortment of Scientific and Laboratory Equipment which are developed in accordance with the latest industry norms and customers’ requirements. Features of our products include: Supreme quality, durability, longevity, optimum usage, performance, optimum performance and corrosion resistance. We are a manufacturer, supplier & dealer of Laminar Flow Horizontal. The bench is made of thick ply board and reinforced with teak wood where every necessary. All visible surface is laminated with white decolam Lamination. All interior surfaces are painted with air drying Epoxy paint. The filter set has rubber padding for a perfect rubber to rubber sealing. The Front & side panels are made of Perspex sheet. We have a wide range of Laminar Air Flow. These instruments are big in size but roller system help in easy movements. Low noise and negligible vibration are the advantages of these instruments. To make the working area contamination free there UV germicidal light and Fluorescent light are available at the inner ceiling. These instruments can work on the low power supply. All interior surfaces are painted with air drying Epoxy paint. The filter seat has rubber padding for a perfect rubber to rubber sealing. The Front & side panels are made of Perspex sheet. 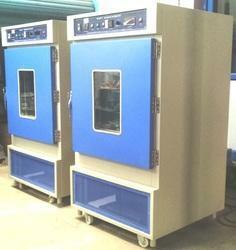 We are a manufacturer, supplier & dealer of Laboratory Incubators. 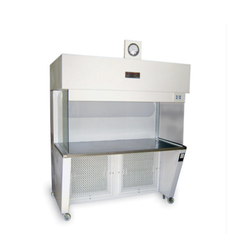 Bacteriological Incubator Lab Model: These Bacteriological Incubators offers reliable day-to-day operation in variety of uses. During and staining of slides, paraffin embedding, tissue culture work, incubation of antibody test, excellent for microbiological determinations etc. 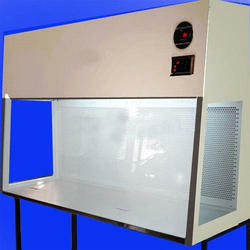 Bacteriological incubator is sturdy, double walled with doors, inner chamber made of stainless steel. Door fitted with Double glass window and heavy stainless steel hinges facilitate inspection of samples without opening the door. Transparent galls door let viewing the specimen inside without disturbing chamber temperature. The outer body is of thick mild steel sheet with attractively finished in powder coating for durable operation. Inner space in between the walls is filled with 2.5” fine glass wood insulation to minimize the heat loss between the walls. 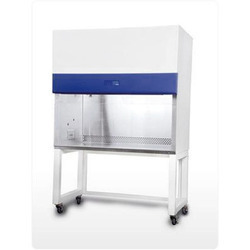 The temperature is controlled by a capillary thermostat variable from + 5oC above ambient up to 80o C with a sensitivity of +/-2o C. inner chamber accommodates easily removable stainless steel perforated trays adjustable height, adjustable Air ventilator is provided at the top. Supplied complete with trays, air ventilators, pilot lamps indicating Lamps on/of switch, Thermostat, & cord and plug. Suitable to operate on 220 volts 1 phase, 50 Hz AC supply. 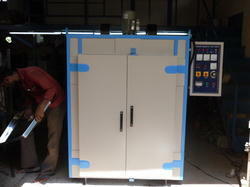 We are a manufacturer, supplier & dealer of Temperature Tray Dryer. 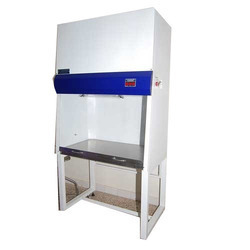 The range of Tray Dryers that we offer is widely demanded in several products manufacturing industries. These are designed as maintain the room temperature or main the required temperature of production unit by drying facility. We are a manufacturer, supplier & dealer of Laminar Flow Vertical. The bench is made of thick ply board and reinforced with teak wood where every necessary. All visible surface is laminated with white decolam lamination.